During June, Cathy DeForest is printing four artists’ books on her etching press for the international project, Al-Mutanabbi Street Starts Here. 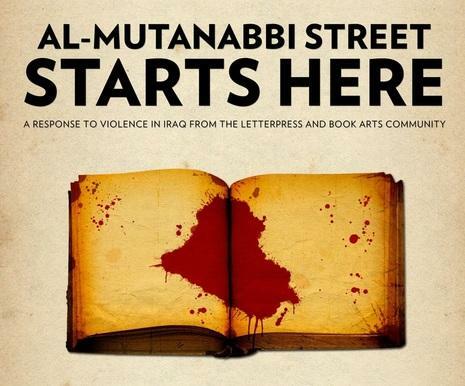 The project is in honor of the ancient bookseller street in Baghdad that was attacked with a car bomb in 2007. Cathy is one of 260 artists from 24 countries whose books will be exhibited for two years in the US and abroad and then given to the National Library of Baghdad. Please contact Cathy for more details. 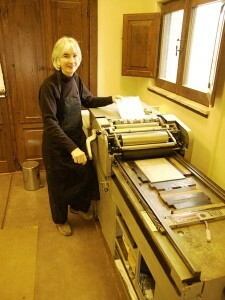 July 14-15, Cathy and Mary Laird will offer a letterpress printing workshop using Cathy’s Vandercook printing press. The workshop is open to beginning and advanced printers. No previous printing experience is necessary to sign up for the workshop. Cathy DeForest Studio is located in a farmhouse just 5 minutes from Ashland. Visits, arranged by appointment, include demonstrations on antique printing presses and a tour of the book arts studio. Cathy’s most recent work includes: etchings, artist books, poetry pockets and a letterpress broadside featuring the work of Barry Lopez. In the past two years, Cathy’s art was bought by: Amherst College, Brown University, University of Michigan, University of Pittsburgh, UC Santa Barbara, Swarthmore College, the NY Public Library, and The Book Club Of California. She was also selected for two upcoming books, 100 Northwest Artists and Thread Loves Paper.